This page contains excessive content, some of which is redundant, or belongs on a different page. Delete anything that's useless, and create extra pages for the stuff that belongs elsewhere! The Domain of Anguish is an elite mission at the end of Nightfall. It consists of four areas: Foundry, City, Veil and Gloom. With smaller party sizes, you typically drop the monk and/or spikers. A / MeMo with Healing Seed can somewhat make up for the lack of the Seeder. A SS spiker can be used to make 2 or 3man spikes slower, but more robust. With 4 or 5 man party size only one tank is used, and the tank usually goes Ranger primary. 4 and 5 Man Tactics. This is only a very generic guide, please refer to the area or role pages for more in-depth guides. (Also often stylized as 3:3/6:0 or 3;3/6;0.) Refers directly to how many of the six Smothering Tendrils are killed in the Stygian Veil at a time. In 3-3, the tendrils are killed in separate sets of three. In 6-0, all six tendrils are killed at once. In general, these terms are also used to refer to the team builds and their associated tactics. Aggro that is caught during a behavioral where the mob is clumping together into a tight ball, rather than wandering around or running from one patrol point to the next. If aggro of a mob is caught during this state, they will tend to break off after being pulled a significantly smaller distance and try to return to their last patrol point. This causes tanks to be unable to do normal pulls. If aggro is bad, it may break off towards the team, so watch out. As soon the tank runs into a group, they will run towards him until they are on “their” range to the tank (melee-, cast-range) If you would stand right behind the tank or even next to him you will inevitably catch aggro. Even if the tank uses his Death Charge to jump into a group, they will break towards the direction the tank came from. So in doubt always keep at least a castrange distance to the tank to ensure to not pull unnecessary aggro. The emo’s Ether Renewal was interrupted. Also “ether stripped”, if the enchantment is removed otherwise. Bonds might go down. If possible, try not to take damage, otherwise the emo will lose energy through Protective Bond penalty. Spike hard and be alert. If you are the tank, you may need to jump in to help. Sometimes it’s fine, sometimes it’s not. a tactic that involves running into the trench on the way to Gloom and spiking only the front spawn along with the patrol in the trench. the path going from monk lord to Gloom, can be used by trench tanks as opposed to running into (and popping) gloom trench. What is the Lightbringer Title for? Lightbringer Title increases damage up to +40% and damage reduction up to -8 against DoA foes. Always display your Lightbringer title in DoA! Always take the Anguish Hunt bounty from the Whispers Informant if you are not rank 8. You may wish to take the bounty even after reaching rank 8 to keep track of your progress. 'Reapplying LB Title means removing and equip again the title, usually done to apply the flat damage reduction after percentage-based damage reduction skills such as Dark Escape and Protective Bond. Why shouldn’t I use a minipet in DoA? Minis do not catch aggro in the usual sense. Rather, minis are counted as allies by many game mechanics, including skills. This means, for example, an enemy might start using AoE skills they wouldn’t otherwise use if you were alone. Notably, if you are tanking Black Beast, Touch of Aaaaarrrrrrggghhh can switch you with a mini which can move you outside of the ball and screw up your block. What do I do if I catch aggro that I am not supposed to catch? Do not pull aggro to the team unless you are instructed to! Otherwise, or if you do not know which enemies these are, you should die in a place where you can be resurrected as easily as possible. If you are NOT able to die in a place where you can be easily resurrected, then stand away from the team. Should I take quests and/or quest rewards in DoA? As a general guideline, do not take quests, quest updates and quest rewards during the run. Taking certain quest rewards triggers boss mobs to appear. Taking a quest reward before the team is ready can cause a major disaster! It is definitely safe to take quests and rewards when the run is completed. You should do so after the run if you have a low LB rank. Note: Sometimes you will hear people say “do not take quest”. Often, this actually means “do not take quest reward”. Can I pick up loot drops during the run? If you’re not sure, ask whoever is organizing the run. Different people have different attitudes towards this. Technically speaking, you can if you don’t have to run away from where you’re supposed to be. For example, you can pick up drops at 360 (the first quest in Veil) between waves. Otherwise, do not pick up drops. Do not delay the run to pick up drops. Delaying the run even by a few seconds can cause strife for the party in critical sections. The same goes for opening Locked Chests. In general you should not worry about monster drops because gems from the end chests are far more valuable. Unidentified golds and lockpicks are worth pennies compared to gem sets. The extreme value of DoA gems makes it not worth your time as a team to pick up random monster drops. Casting range (or caster range) is the maximum range from which you may use a skill on a target (unless the description states otherwise). 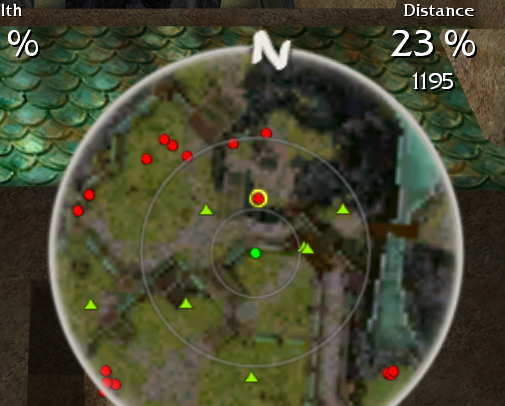 If the distance between you and the target is larger than this range, the game will automatically run you towards the target. However, the game WILL move you not just into casting range, but in aggro range. The target will therefore see you when you begin using your spell rather than when the spell finishes casting. This is important for monsters that use interrupts. You should never auto-run to these targets because it will give them a chance to interrupt you. Instead, select the target, then walk so your bubble almost touches the yellow circle. This will ensure the target sees you only when your first skill is successfully used. Use this tactic especially before Fury spike in Foundry. Guardians of Komalie have a variety of interrupts. This is also useful to avoid Gale at City wall.